9:20AM PDT - They kept everyone outside a little longer than we would have liked, but they're finally admitting. 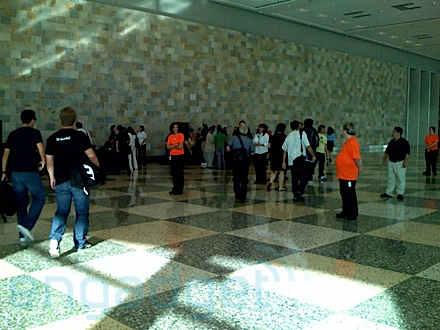 This is the Moscone West -- we're assuming the huge hall Steve launched the iPhone in back in January. 9:23 - We're in and headed up! 9:32 - We're upstairs, the press is gathering. All the usual suspects are here; Mossberg just cruised up. This event space seats thousands, so we're a little surprised Steve's doing an event here for just a few hundred journalists. We're expecting a lot of empty seats... or a Cirque du Soleil performance on the open floor. 9:48am - So we're in and seated, and yeah, the event is far smaller than it could be given the amount of space. Usual Apple soundtrack, Coldplay's on the speakers. 9:55am - It's pretty well full up, but definitely not crowded to the brim. White Stripes, Alicia Keys, cameras on cranes and booms to film the event, all the familiar sights and sounds. 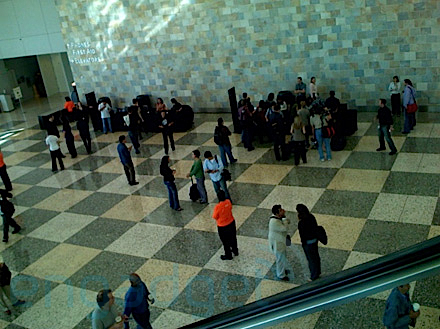 9:57am - "Good morning ladies and gentlemen, welcome to this special Apple event. We'd like everyone to take a moment to turn off ALL electronic devices." Apparently this special privilege is reserved for Stevie, and Stevie alone. Well, this isn't an airplane, and if they think we're NOT going to liveblog this, they've got another thing coming. But yeah, we'll def switch off our ringers. 10:01am - Lights are dimming, here we go! 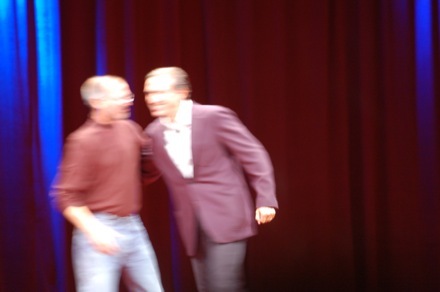 Music's over, lights go up, Steve takes the stage! 10:02am - Rounds of applause and cheering. And more. "Thank you." He's grinning. "Today we get to talk about music, so let's start with iTunes." "iTunes is a pretty amazing phenomenon." 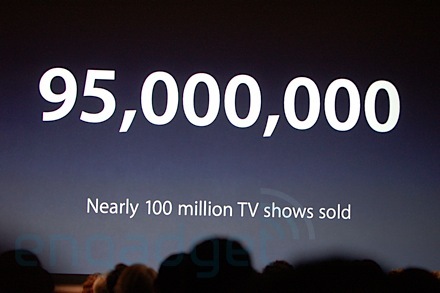 Facts and figures: 600 million copies of iTunes distributed. 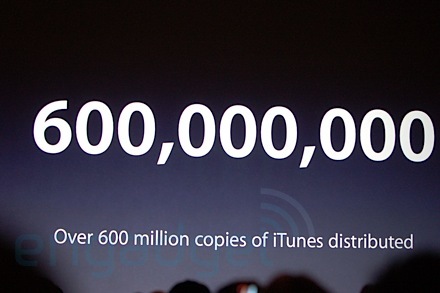 Over 3 billion songs bought on iTunes. "We're pretty amazed at this." Giggles. "This is the number one music store in all 21 countries we operate in." 10:04am - "We started with just 200k songs, but we have over 6m songs in every single one of those stores. Millions ahead of anyone else. We've become the number 3 music retailer in the US -- behind Wal-Mart and Best Buy, ahead of Amazon and Target." Over 550 shows, sold over 95m shows, 125k podcasts. "This is amazing material, it's free, and over 25k are video podcasts." 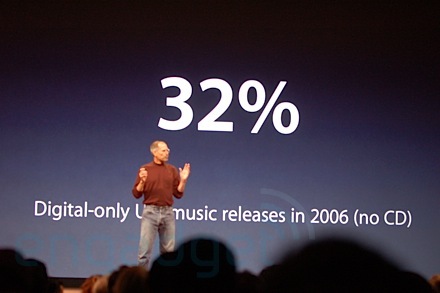 10:05am - "This last statistic blew my mind: in the US of all the music releases in 2006, 32% were digital-only releases. They weren't released on a CD. Live concerts, independents. Look how far we've come. A THIRD of the music released in this country was digital only." 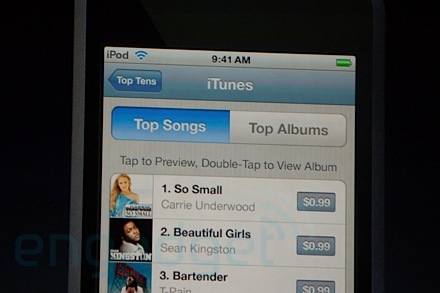 "iTunes is clearly leading the way. We're going to ship a new version of iTunes tonight to support some new products. The biggest new feature: ringtones." 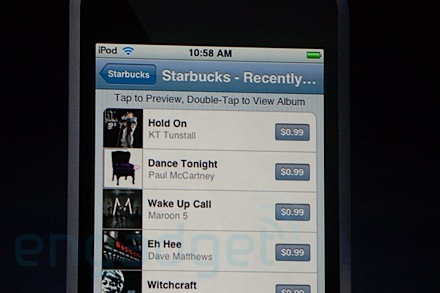 10:07am - "Our ringtones are going to cost just $.99 in addition to the song." Psh! You have to pay a second time to use a purchased song as a ringtone?! 10:08am - "Here's how it works... when you plug in your iPhone a new column will pop up with bells -- that shows how many songs you can make ringtones out of." Any segment up to 30s long, fade ins/outs. "When you're ready to buy, push the buy button and for 99c you have a ringtone." Demo time. 10:09am - "I like Aretha Frankin's Respect -- I can just tell this is going to make a great ringtone. I can put it on my iPhone, make it my default ringtone. I'm going to assign this one for when my wife calls..." laughter. 10:10am - Steve's grooving to R-E-S-P-E-C-T on stage. 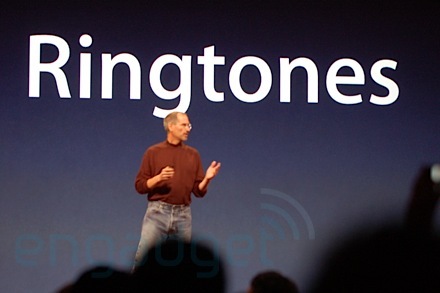 "There we go, that's what I want, and I'm going to just buy this ringtone right now." The clip appears in the ringtones folder along with other clips of music Steve didn't mind buying twice. 10:11am - Gonna Make You Sweat by C+C Music Factory? Damn Steve. "Isn't this great? Pick the exact section of the song you like, make a ringtone out of it!" Uh oh, he's playing the Beatles... Give Peace a Chance... "That's when NBC calls." Uproarious laughter. 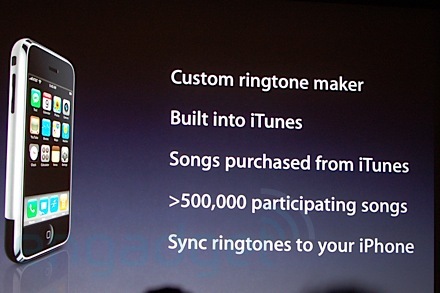 10:12am - "You can assign it as your default ringtone, or to your favorite people when they call... custom ringtone maker built in, over half a million participating songs, sync 'em right on your iPhone. We're going to turn this on next week. You'll need the new version of iTunes we're going to ship tonight. So that's the first thing today." Applause. 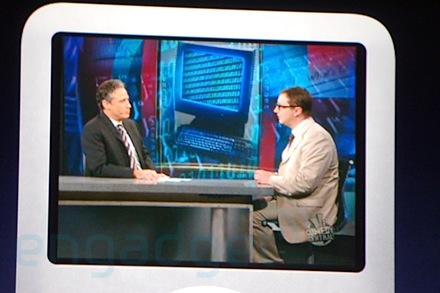 "Now let's talk about the iPod. It's doing really well. They're... rather strong." Teehee. "We've sold over 110m to date... and you'll notice the place where the sales curve is strongest is during the holiday season... today we're going to refresh or replace EVERY single product in this lineup to get ready for this holiday season." 10:13am - "Let's start out easy... iPod shuffle. Refresh for this product. Holiday 2007 we're going to give it some new colors, when you see these in person you're going to love them. We also have something called the PRODUCT(RED) nano..."
10:14am - He's explaining the RED thing. "We are adding a RED shuffle -- if you want to do something about these diseases in Africa. 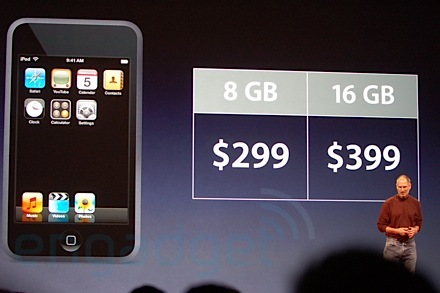 Same 1GB of storage, $79, shipping today, available shortly. 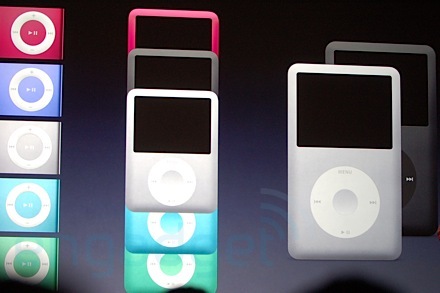 Now let's move on to something more substantial, the iPod nano." 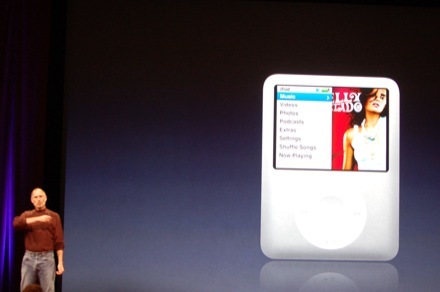 10:15am - "It's the most popular music player in history. People just love it. We want to make it better, and customers have told us how we can make it better. Customers want to watch video on their nanos on an even larger, brighter display. 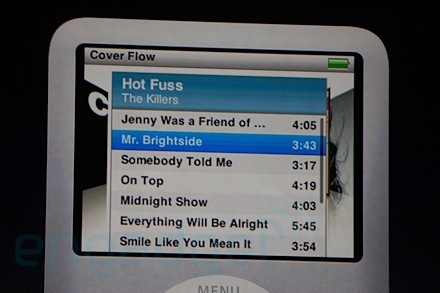 We'd like to put Cover Flow in, we think it's a great way to browse your music library." "Games. 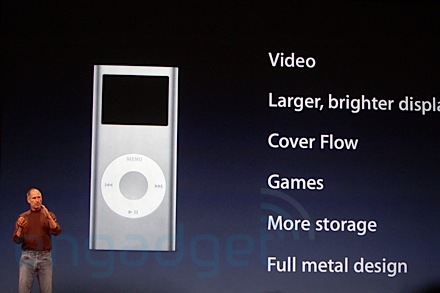 More storage, and a full metal design. 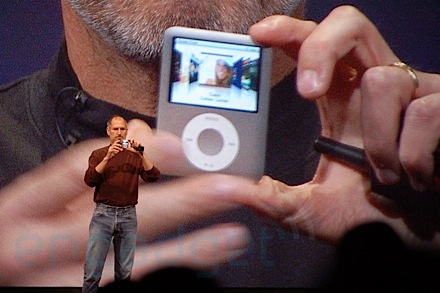 We're introducing a new nano here today... let me show it to you." It's the fatty! 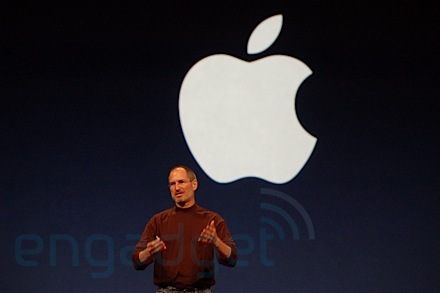 10:16am - "It's incredibly tiny, this is the new nano, it's incredibly thin. It's REALLY nice." Huge applause. "Let me show you some bigger pictures of it... comes in beautiful colors. So what's the video like? 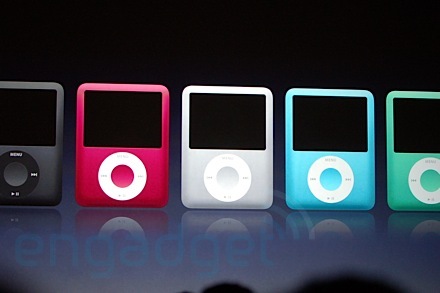 New nano: larger 2-inch screen, it's going to look the same as it did on the iPod video, it's the same QVGA resolution. We've achieved this with a screen with the highest pixel density we've ever shipped." 10:17am - "We've also got an enhanced UI. It's going to show you album artwork floating by. When you're on videos... photos... it will even show you what you're going to get when going to extras. And we've got Cover Flow. Take your thumb, roll it around the wheel, it looks really nice. It's pretty stunning, all in such a tiny device. We're really, really happy with this." 10:18am - "We're also including 3 games bundled in with the nano. Let me show you one now, it's called Vortex." Demo time -- it's basically Arkanoid made circular. "We've also done some other games we're selling on iTunes." 10:20am - "Isn't that incredible? All in a product this big. 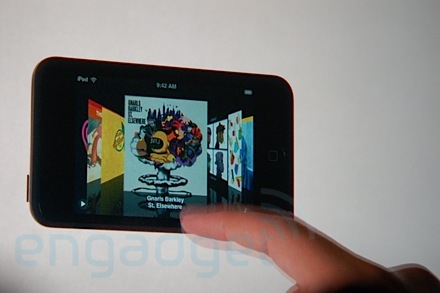 Video, new UI with Cover Flow, games... let's take a look at the new iPod nano." Demo time again, Beatles album artwork in screen. He does this every time! He's scrolling in Cover Flow -- it looks decent, but a bit choppy and slow. Not super surprising considering the nano doesn't exactly have a lot of horsepower under the hood. Don't expect the iPhone Cover Flow experience, people! 10:21am - "It's that simple to browse your music collection." Doing video now. "I love Jon Stewart, I hope all of you watch his show. It's the best place to get the news every day." 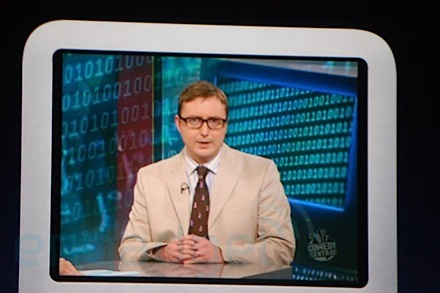 Showing the John Hodgman clip on net neutrality, trying to get Hodgman to admit to being a PC. Highlarious. 10:23am - Podcasts now, showing G4's Freestyle. Now photos... "I can just scroll through these photos here." iPhone-like motion... oh no, a photo montage to Green Day's Time of your Life song. 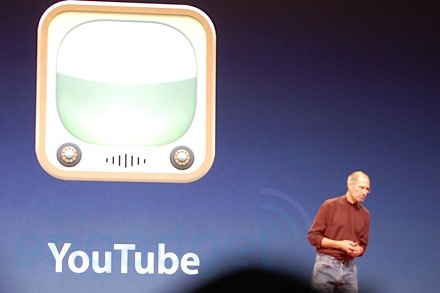 10:24am - "When we went about replacing the most popular music player in the world we took this really seriously. We think we've nailed it with the new nano. 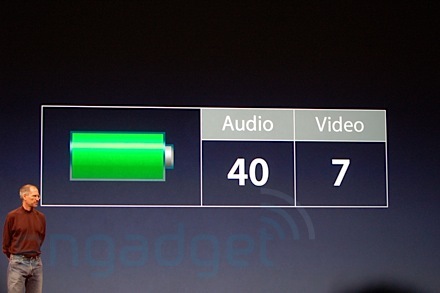 The battery life is awesome: 24 hours audio, 5 hours video playback." Applause and cheers. 10:25am - "Let's talk about storage: a 4GB and an 8GB version. 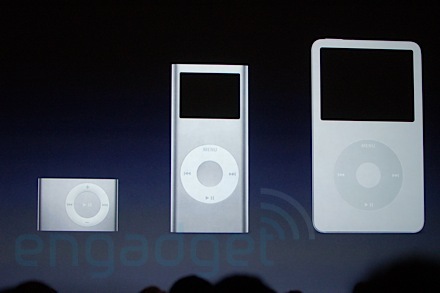 The 4GB version will come in silver, the 8GB will come in all the colors. 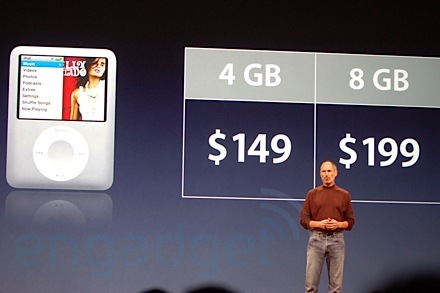 The 4GB will be priced at just $149. 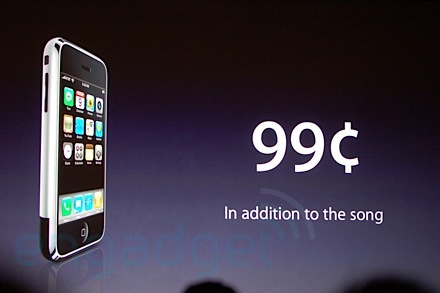 The 8GB version will be just $199." Applause. "These new nanos have left our factories, they've shipped and will be in our stores by this weekend." "Our line for it: A little video for everyone." Showing the ad for the new nano. 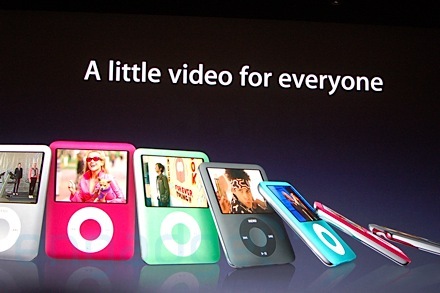 10:27am - "A little video for everyone, that's what we set out to do with the new nano. 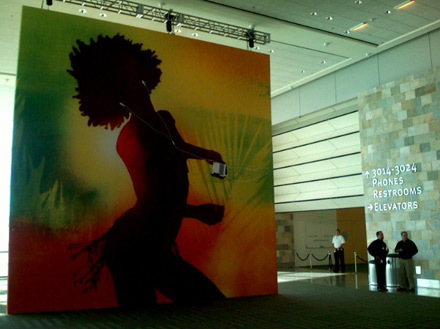 We hope you love it as much as we do... That brings us to the iPod. The iPod... it's got a... it's got a funny name. It's got a funny name. 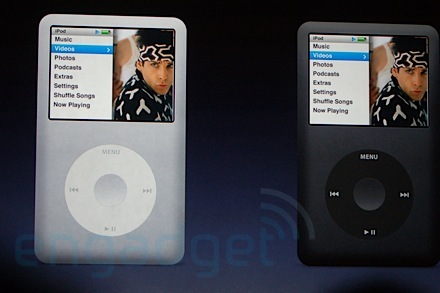 It's time to give it a name: we're calling it the iPod Classic because it's the original iPod." Ha! 10:29am - We're going to offer a slightly thicker one as well... and it's going to have 160GB." applause. "This BOGGLES the mind! 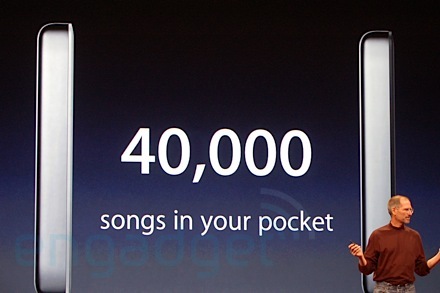 This new 160GB, which is far smaller than the original iPod, puts 40k songs in your pocket. 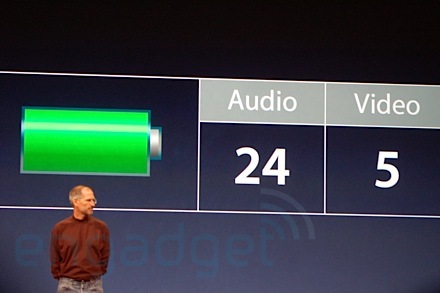 Even better: battery life. 40 hours audio, 7 hours video." 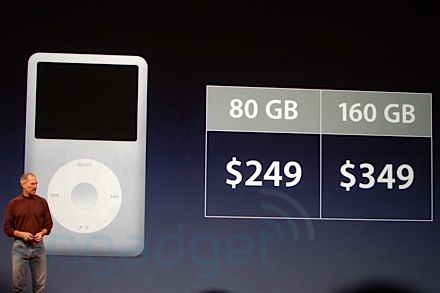 10:30am - "The 80GB used to sell for 350, now it's 250.The 160GB is $350." Applause. "They're both available today, they're shipping and be in stores by this weekend. We think you're gonna love 'em, and the enclosure is just gorgeous. So let's take a look at the iPod lineup for this holiday season..." review time. 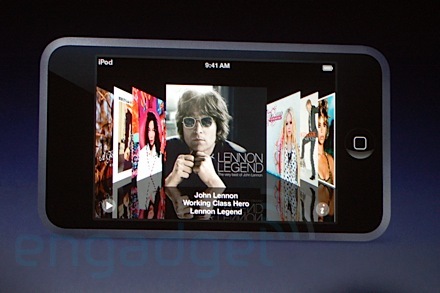 10:31am - "This is an incredibly iPod lineup for this holiday season." Applause. But he's not done. "But... we're not done yet. Far from it." 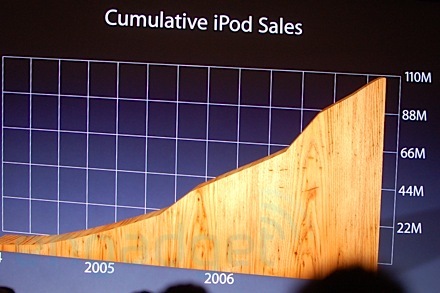 "When we introduced the iPhone in Jan, we said it was the best iPod ever. 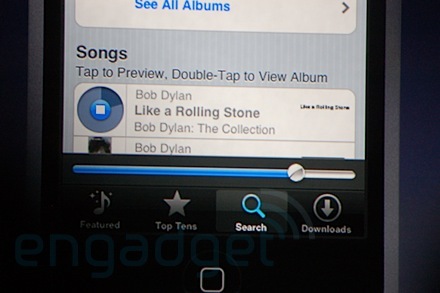 and iPhone owners agree with us, it's incredible with its multi-touch interface, it is the best iPod ever. 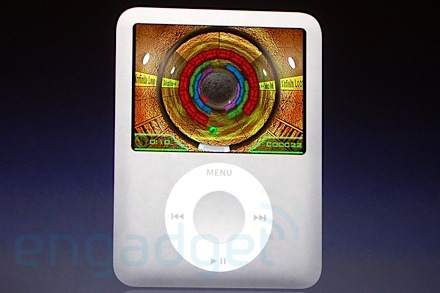 People have been asking us when we're going to bring this technology to the iPod. The answer is we're going to do it today. And this is what the product looks like." It's a friggin iPhone! 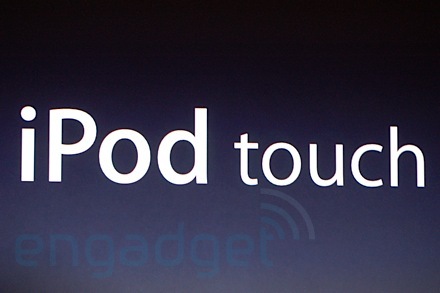 It's called the iPod Touch. 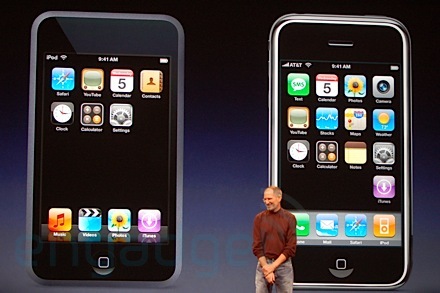 10:32am - "It's the same size screen as the iPhone, but it's even thinner. It's 8mm thin. Unbelievable. 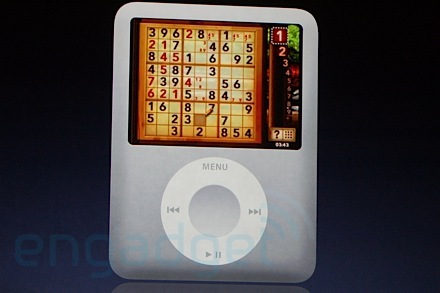 The new iPod touch. It's one of the 7 wonders of the world." Laughter. 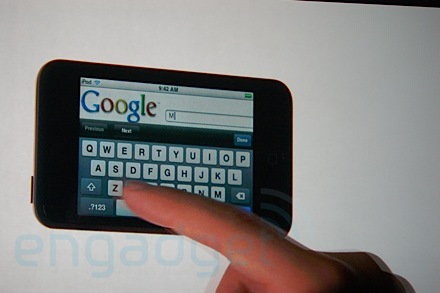 10:33am - "It features our revolutionary multi-touch interface that you've come to know and love on the iPhone. If you've used an iPhone you'll feel at home, it's exactly the same. Scroll through the artists with a flick of your finger. Turn it into a landscape position, it goes into Cover Flow, it's just magical." 10:34am - "All on this 8mm device. Let's look at video... all on this gorgeous 3.5-inch widescreen display. 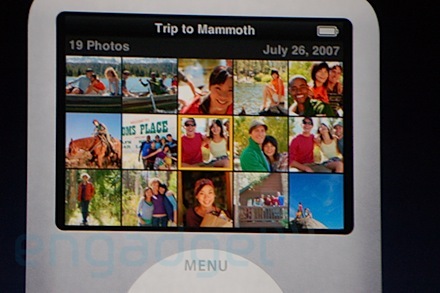 And photos... just like the iPhone this is the best way to share photos on a portable device. Ever. Flick through them, pinch them to make them larger or smaller." 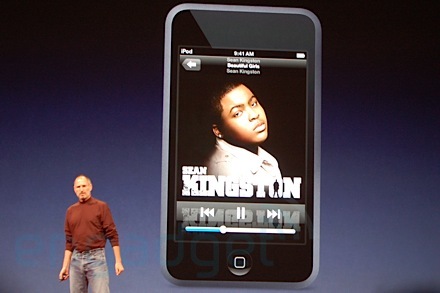 10:35am - "Let me go ahead and show you the new iPod touch. Again, slide to unlock. Here we are -- let's go into music." The icons look really strange and sparse on that huge screen. It's freaking us out! Steve's browsing by Cover Flow -- note: it has WiFi! The WiFi meter is up at the top where it would be on the iPhone. 10:37am - Steve's watching, um, Wild Hogs. He's not having a mid-life crisis, too, is he? 10:38am - "Let's take a look at photos here... it's great, let's go into an album... I can just go like this, flick through these photos. There's just never been a better way to share photos with friends on the go. It's sooo nice. Turn it back. Boom." Icons: calendar, contacts, clock, calc, settings, music, videos, photo..."I showed you the clean side... I was keeping a secret. 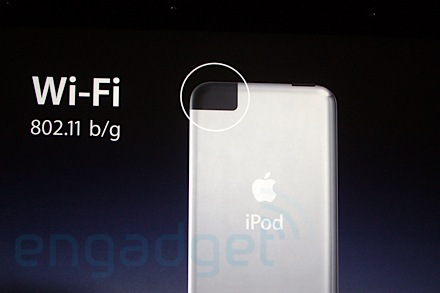 We've built in WiFi to the iPod touch." The antenna looks, um, bad. 10:39am - 802.11b/g -- "Others have done this and it's failed. We understand why it's failed, and we know what to do make it successful. Well, what's the problem with WiFi? Well, part of the problem is getting onto WiFi... you may be fine at home and the office, but anywhere in between can be challenging." 10:40am - "You may log in but you'll get a screen. Even walking through Stanford University you get a login page... so you can build in the hardware but you can't get the network [without the page]. So what do you do about that? 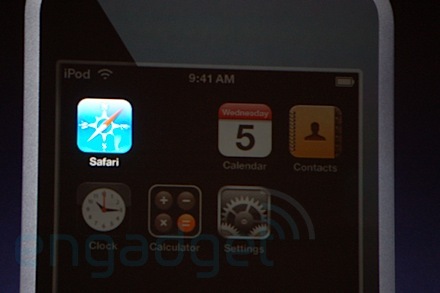 We're going to add an application to the touch: the Safari web browser." 10:41am - This really is the phone-less iPhone. 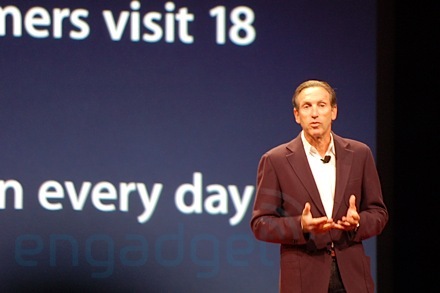 "But besides being able to log into WiFi, you get an incredible web browser! 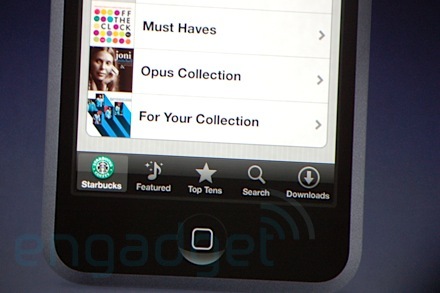 It is the best web browser on any mobile device, and it's built in to the iPod touch." 10:42am - "We're very, very excited about this. First time EVER on a music player to have a browser built in." Uh, totally not true: look at Archos. "Why stop there?" YouTube's on the Touch as well. 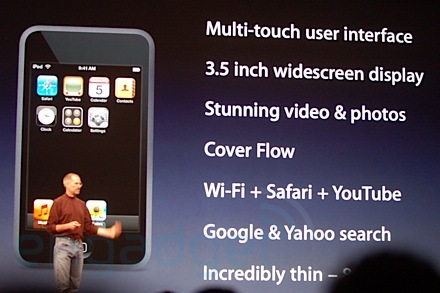 10:43am - "Watch millions of free videos streaming over WiFi to the iPod touch. Let me show you these things..." Demo time! 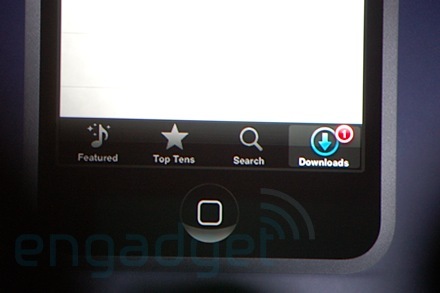 The hidden icons are now apparent -- the two missing were Safari and YouTube. Still looks a little sparse though! Looking on the NYT. "We can go over here... boom." Aw, it was a little boom that time. 10:44am - Steve's now browsing Facebook. "We're pretty excited about this." Applause. 10:45am - Bookmarked videos... "You get the idea, this gives you a feeling for what Safari and YouTube are like on the new iPod touch. We've built WiFi in and we've made it USABLE. We're REALLY excited about this." 10:46am - Connector on the bottom, but no speakers. "This is a worldwide product, the first touch product Apple's going to ship outside the US, it's going to be shipping all around the world." 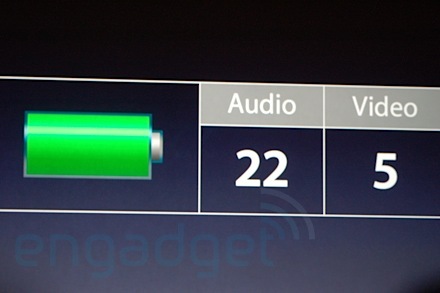 "The battery life is fantastic: 22 hours audio, 5 hours video playback. All in something this thin. It's... it's... amazing to me. 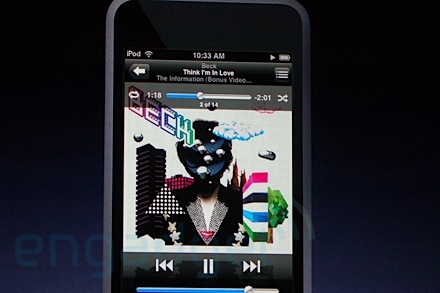 The new iPod touch." 10:47am - Review time: multi touch, widescreen iPhone display, Cover Flow, WiFi, Safari / YouTube... "We're going to offer it in two configurations, the first is 8GB, the second is 16GB of storage. Again, how do you fit all this in here?" 10:48am - So, 8GB is $299... the price for the 16GB is $399." Less applause on the second one. "Both models are available in just a few weeks... they'll be shipping this month." 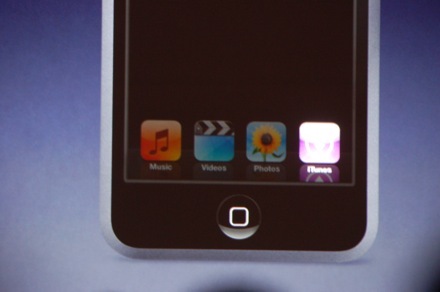 He's gonna show the iPod touch ad now. 10:49am - Not shabby -- and thankfully no more Orba Squara iPhone music. But there is one more thing... if you'll bear with us for a few more minutes. 10:50am - "You might have noticed there's an empty spot there on that dock. What could that possibly be for, you might ask? 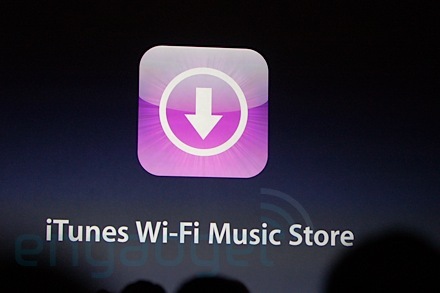 It's for a new application we've written for the iPod touch, it's called the iTunes WiFi music store." Huge applause. "FINALLY, some of you are saying. Let's take a look at what it is." 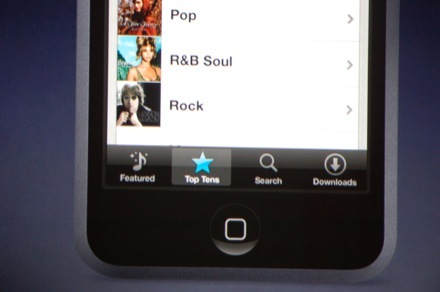 Four buttons: featured, top tens, search, downloads... "If you see something you like, tap it, free preview of the song." "You are now downloading the song... when it's done you can listen to it on your iPod touch, and it syncs back up to iTunes." Applause. 10:52am - "You can search for anything in the entire iTunes store. You can search for any artist, any song name, any album name, preview it, and if you love it go buy it. 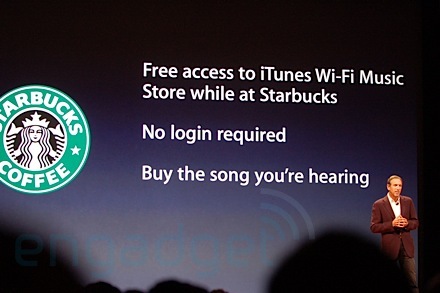 This is the new iTunes WiFi music store. Let me show it to you now." 10:53am - "Demo time: This is live coming over WiFi. I love John Lennon... so I'm going to buy this. It's now downloading... it takes a few seconds and once it's downloaded I can go to the downloads playlist and I can play it with album art and everything else. This is all live." "Isn't this incredible?" Applause and cheers. 10:55am - "WiFi, as you may know, is faster than any 3G cellular network, so it's really fast." Zing! 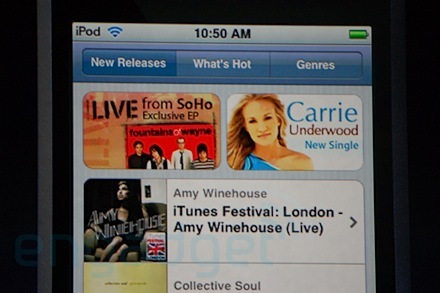 10:56am - "So, not so bad for the new iTunes WiFi music store." Applause. 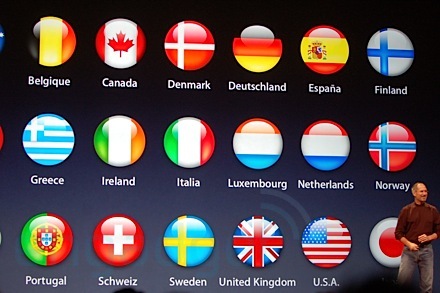 "The new music store will be available internationally in every one of those 22 countries Apple operates in. 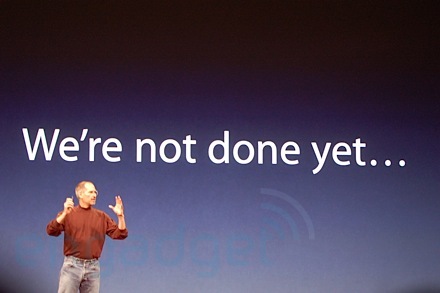 We're gonna do something else, too: we're gonna bring it to the iPhone." Big applause. 10:57am - "It's going to come later this month with a free iPhone update -- everyone with an iPhone is going to get this too. We're really, really excited about this. There's even ONE MORE incredible part of this. We've been working on this for two years." 10:58am - "I can't tell you how much pleasure it brings me... we have a GREAT partnership with Starbucks we're announcing today. We love Starbucks. It's an incredible phenomenon in our culture. 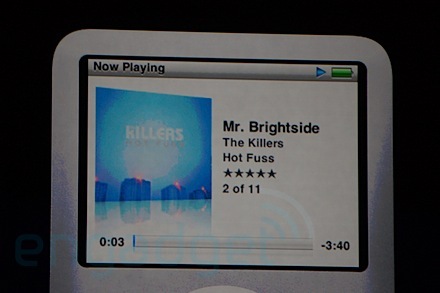 We want to combine our great iPods and our love of music and their great coffee and their great love of music." 10:59am - "When you get near a Starbucks a fifth button will come up in the WiFi music store -- you may have been in a Starbucks wondering what song is that playing? Now you can buy it with a tap of your finger. And if you just missed it, you can still find it..." Is anyone else underwhelmed by this "feature"? Demo time. "So they just built a Starbucks back stage." Laughter. "They're playing a KT Tunstall song... I can go in here and preview it." 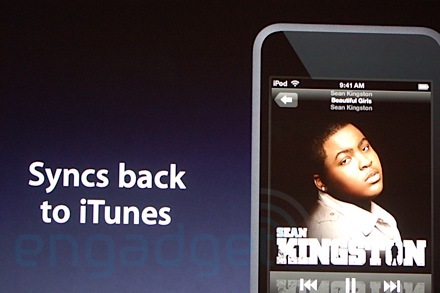 11:01am - "It will be right on my iPod touch, and sync right back to iTunes when I get home. We're really, really excited about this partnership. 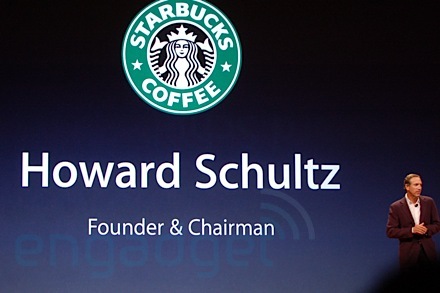 It's my great pleasure now to welcome Howard Schultz, founder and chairman of Starbucks." Big applause -- but why? Pretty weak, if you ask us. 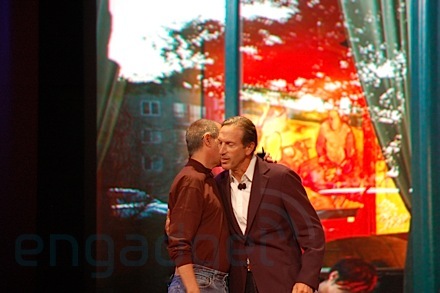 "Thanks Steve, I was NOT back stage visiting the store, but I was waiting for you." Har. 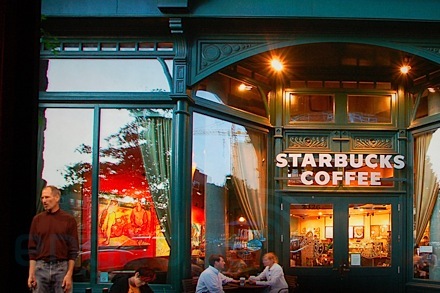 "Let me provide you a snapshot into the global reach and ubiquity of Starbucks." Yeah, we get it, Starbucks is like air for their customers. 11:02am - "We open 7 stores every single day." The room sounds like someone just hit everyone in the gut. 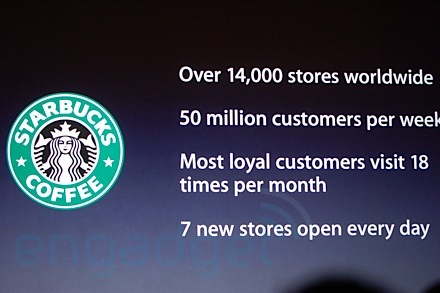 Over 14k stores, 50m customers per week, 18 visits per month per customer. Yowza. 11:03am - "Who would have thought that a coffee company could win a Grammy? Let alone 8, when we co-produced with Concord Ray Charles's last album." 11:04am - He's going on about how this is going to transform the marketplace. Dude, let's not delude ourselves here. It's big, but it's not that big. 11:05am - Free access to the store while at Starbucks. 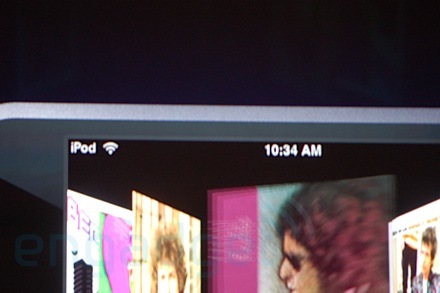 11:07am - It's exclusive with iTunes -- we wonder how T-Mobile feels about partnering indirectly with Apple. 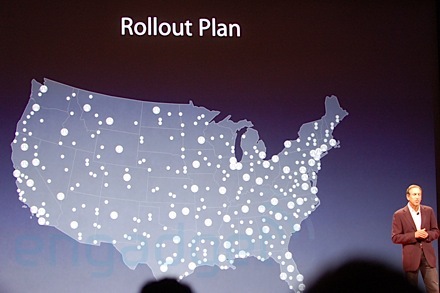 Ok, rollout plan: 5800 WiFi-enabled stores nationwide. Starting October 2nd: New York and Seattle. 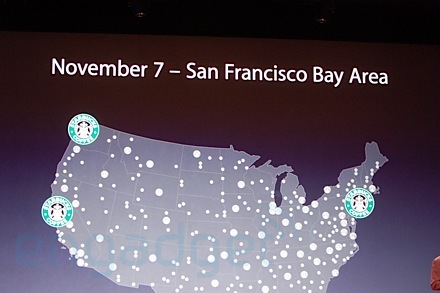 600 stores, followed up in November with 350 stores in SF. 11:08am - ...then LA and Chicago in '08. By 2009 they hope to have all WiFi Starbucks completed. [Our customers] are really going to respond to this." Oh really? Ok, Steve's back on. Big, big applause. 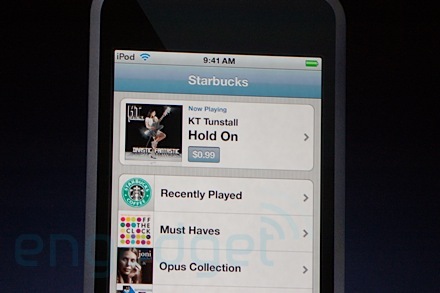 11:10am - "We know a lot of people that are going to be happy with this new combination of coffee and iPods." Heh. 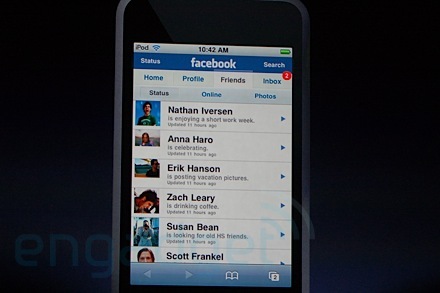 "It's one of the three apps using WiFi built into the new iPod touch. 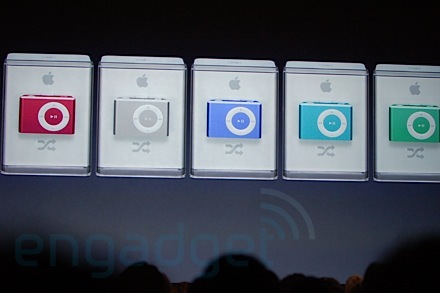 So let's look at our lineup for this holiday season: the iPod shuffle in 5 great new colors. 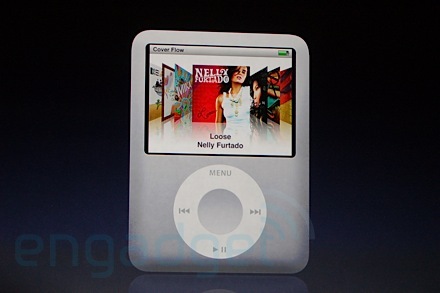 The iPod nano. 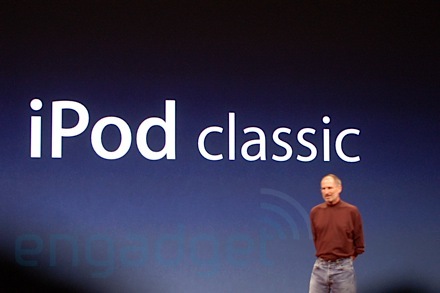 The renewed iPod classic with up to 40k songs in your pocket. 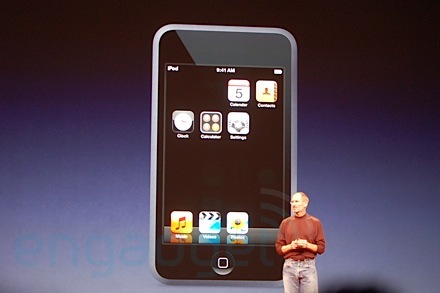 The revolutionary iPod touch that you've seen here today." "We think this is going to set a lot of peoples' worlds on fire. 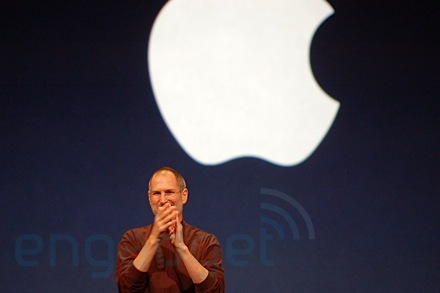 And I'm going to include the iPhone, because as we've said, it's the best iPod ever." 11:12am - "But we want to get even more aggressive with this. Take a look at the iPhone. 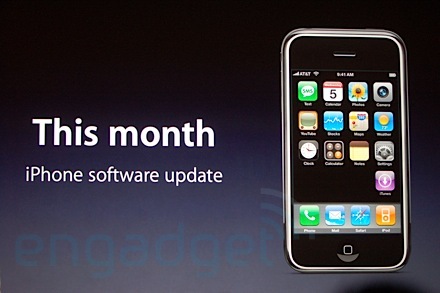 You know, the surveys are in: the customer satisfaction numbers on the iPhone are off the charts. They're higher from iPhone owners than any Apple product. Ever. They LOVE them. We want to make the iPhone even MORE affordable for even more people." "So we're going to do something about that today. We're on track to ship our 1 millionth iPhone this month -- to get ready for the holidays here's what we're going to do. 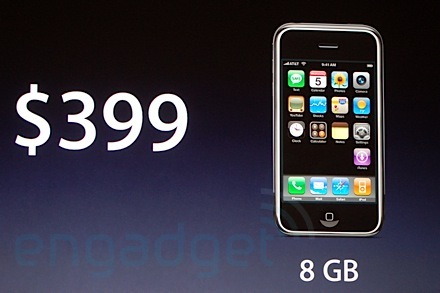 It's clear customers want the 8GB model -- it's not going to sell for 599 anymore. "Starting today effective immediately, we're pricing it at just $399." HUGE applause. "We want to put iPhones in a lot of stockings." But what about the 4GB? Does that mean it's being discontinued? "Thank you very, very much." 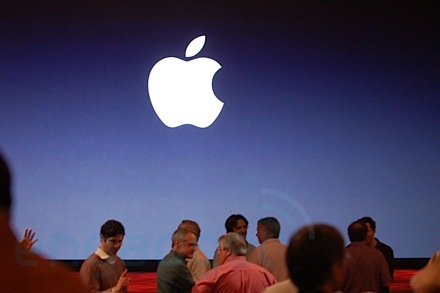 11:13am - Applause... "A lot of people at Apple have worked on these products. Some are here today, some are watching from our campus in Cupertino. I'd like those folks to stand up..." Wow, this is like half the audience. 11:15am - "One of the traditions we have at our music events is to remind ourselves of why we do all this. We all love music too. 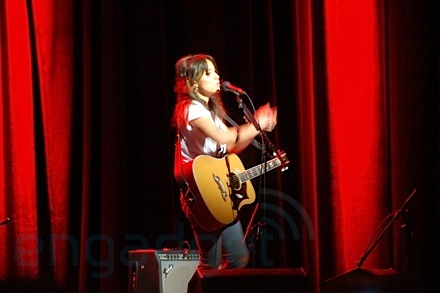 There's nothing better to remind us of that than to have a musician come perform for us: a really talented young musician, flew in from across the pond, KT Tunstall. She's very hot." Chuckles. 11:16am - Her drum machine messes up: "Technology, eh?" 11:19am - KT's performing on stage. 11:21am - KT: "I'm very much looking forward to the 'iLoop pedal'." Waaah. 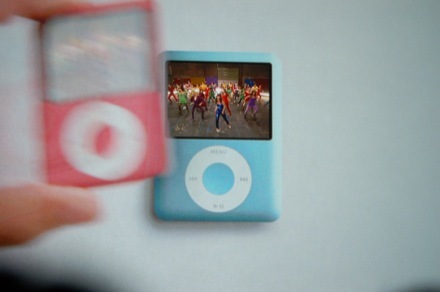 "It's fantastic that Steve Jobs is making it more fun to pay for music than steal it!" 11:22am - Looks like that's it! We're out of here!